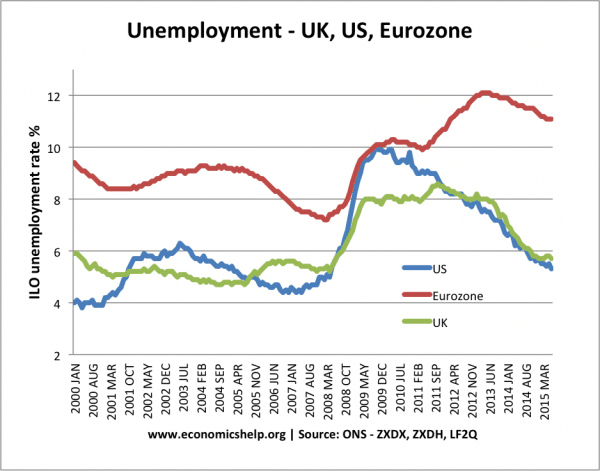 Home > Economics help blog > euro > Should the UK Join The Euro? There was a time when joining the Euro was a big issue, frequently debated in the UK. With Brexit referendum, it has become almost irrelevant. However, if leaving the EU proves disastrous and public opinions changes – rejoining the EU, may well involve signing up to the Euro – as new members may not get the opt-out, the UK received. 1. No Devaluation. In the Euro, you can’t devalue if your currency becomes uncompetitive. This has been a significant problem for Euro countries like Spain, Italy and Greece. Compared to Germany, these countries have seen higher wage growth, higher inflation and lower productivity growth. This means their exports become uncompetitive leading to lower demand and lower growth. This is reflected in large current account deficits in these southern EU economies. 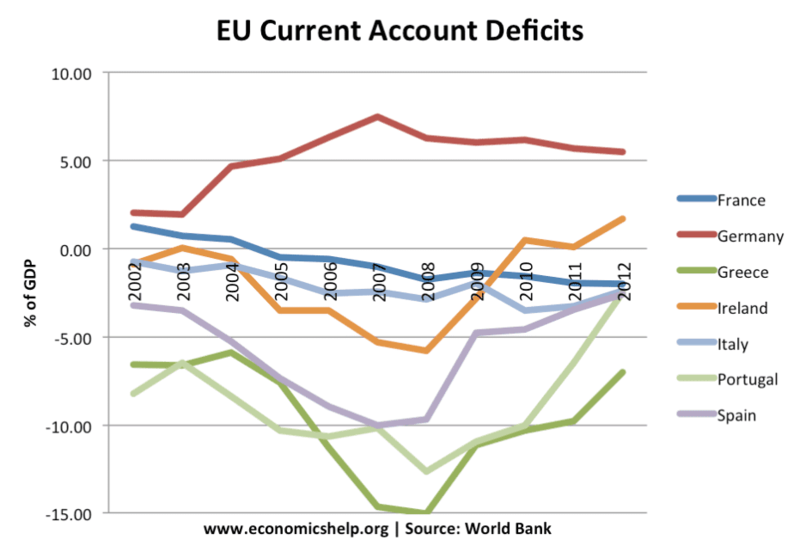 Greece, Portugal and Spain all had a current account deficit of 10% of GDP or more – a very serious economic imbalance. By contrast, the UK has been able to devalue, restoring our competitiveness and giving our economy more flexibility. 2. No Independent Monetary Policy. In the Euro, interest rates are set by the ECB for the whole Eurozone area. However, this monetary policy may not be good for the UK economy. In 2008, the UK was very hard hit by the financial crisis. In response, the UK could cut interest rates very quickly. Also, the Bank of England was able to pursue quantitative easing to try and stimulate economic activity. If the UK were in the Euro, it would not be able to do this. Therefore, I believe the UK recession of 2008-11 would have been even deeper if the UK didn’t have an independent monetary policy. 3. UK Housing Market. The nature of the UK housing market means that the UK is very sensitive to interest rates. In the UK, many home-owners have high variable mortgages. This means a small increase in interest rates has a big effect on consumer spending. Therefore, it is even more important that interest rates are suitable for the UK economy. 5. ECB overly concerned with inflation. The ECB has an over-riding objective of low inflation. Arguably this is at the expense of promoting economic growth and inflation. In response to a small degree of cost-push inflation, the ECB raised interest rates, showing to markets they were willing to risk core-inflation falling below target, despite low growth or recession in parts of the Eurozone. The Bank of England by contrast, tolerated a higher rate of inflation because they felt more important to avoid a double-dip recession. The above graph shows that the Eurozone has significantly higher than the UK and US – this is partly due to structural unemployment, but also reflects the deflationary bias of the Eurozone. Price transparency. In the Euro, it would be easier to compare prices between the UK and other Eurozone economies. Insulation against exchange rate fluctuations. Helps exporters to know future costs and incomes. Helps the UK to be at the heart of the Eurozone and have greater influence over policymaking. Membership of the Euro has potentially very serious consequences, and significantly increases the risk of deflation, recession and a debt crisis. These potential problems far outweigh the small benefits of joining. ← Would the Pound have fallen without Brexit? I think Britain should have joined euro in the early 2000s and I still think that Britain should remain in the EU and join the euro. Yes there will be teething problems, but as part as a large block Britain will prosper as part of a single market and a single currency.